If you’re looking at cycling any more than the casual commute to work, a good pair of padded bike shorts are going to be an essential part of your cycling toolkit. There are many bits of kit in the cycling wardrobe where you can get away with using general-purpose sportswear repurposed from other sporting activities to save a bit of money. Bike shorts, however, are a specialist piece of gear and can’t be casually replaced with any old pair of lycra sport shorts. A decent pair of purpose-built padded bike shorts will save you a great deal of discomfort in the long run, and help you to keep cycling for longer periods of time. The market for padded cycling shorts in 2019 is a busy one, with a huge range of similar-looking models available and a field choked with technical jargon. This guide is here to help clear that up a little, however, and to ensure that you can find the right pair of padded cycle shorts for your needs. The Sponeed Men’s Cycling Shorts are mid-length, sturdy shorts designed to support your thigh muscles and prevent bacterial infections. Constructed from moisture wicking materials with anti-microbial properties, they effectively reduce the buildup of moisture and related bacteria around sensitive areas, minimizing the risk of infection from long-term cycling. The shorts are constructed from 6 panels, all made from 4 way stretch lycra materials, providing ergonomic thigh support with maximum stretch and flexibility to keep your legs as comfortable as possible while remaining tight and unobtrusive, as much like a second skin as bicycle shorts can get. 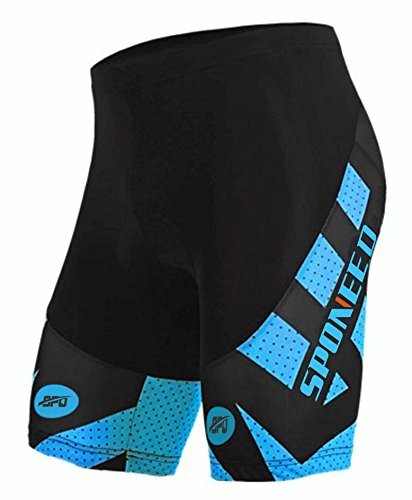 Why We Liked It – Anti-microbial features make the Sponeed Men’s Cycling Shorts a great choice for anyone concerned about the potential health impact and risk of infection from extended periods of cycling, while the inbuilt silicone leg grippers prevent the shorts from riding up, maximizing comfort effectively. 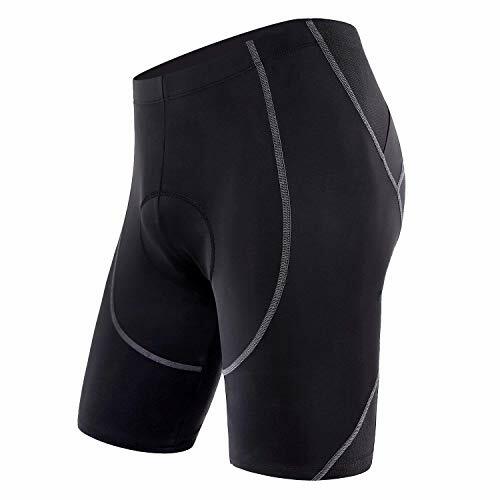 The Baleaf Men’s 3D Padded Bike Bicycle Mountain Bike Shorts are small, heavily padded shorts designed to be comfortably worn underneath longer shorts or leggings for added comfort when riding mountain bike style. With a sturdy, ergonomically padded 3D cushion built into the shorts, these bike shorts offer an exceptional level of padding and comfort in a small, lightweight package. Further comfort features are built into the design; the Baleaf Men’s 3D Padded cycle shorts are constructed from a lightweight, moisture wicking fabric and assembled with flat seams to reduce chafing and irritation. Light enough to be worn under shorts or leggings of whatever length you find most comfortable, these padded bike shorts add an extra level of comfort to any cycling outfit. 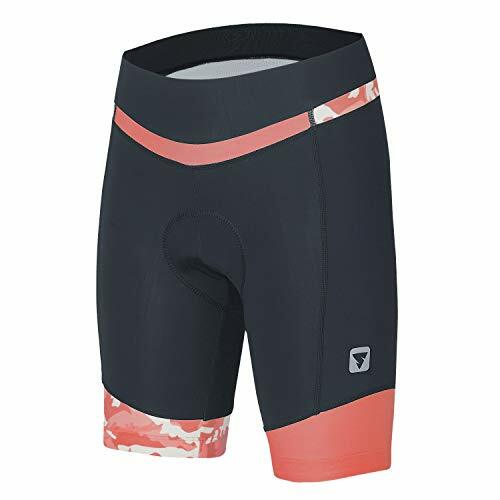 Why We Liked It – The focus on added padding in the design of the Baleaf Men’s 3D Padded Bike Bicycle MTB Cycling Shorts is impressive, boosting the comfort level of whatever your favorite legwear is as soon as they’re worn underneath. 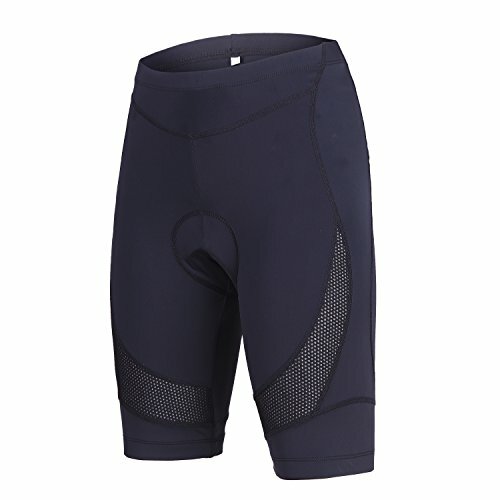 Built with a large padded cushion for added comfort, the Ohuhu Men’s 3D Padded Bike Bicycle MTB Cycling shorts are small and light enough to be worn comfortably under another pair of shorts or leggings for a comfort boost. The inbuilt cushion is padded with a combination of soft foam and silica gel pads, ergonomically designed for maximum comfort on a bike seat. The fabric is designed to be elastic and flexible, as well as wicking away excess moisture and heat to keep you cool and dry even when cycling hard. It’s worth noting that sizes for the Ohuhu Men’s 3D Padded Bike shorts run a little small, so bear that in mind when ordering, but their construction is sturdy and comfortable enough to make them a good buy despite this minor issue. Why We Liked It – Comfortable and heavily padded undershorts, the Ohuhu Men’s 3D Padded Bike Bicycle MTB Cycling Shorts offer impressive comfort in a small, heat-wicking package. They’re a great choice to wear under larger shorts for comfort. Longer in the leg than many other 3D padded undershorts, the Beroy Women’s Bike Shorts with 3D Gel Padding are large enough to potentially be worn without an over layer in hotter weather. Designed as undershorts to be worn beneath your favorite longer shorts, these come with comfortable ergonomic gel padding, available in a range of different thicknesses to suit differing comfort needs. Whether you prioritize lightweight, thinner shorts or more heavy duty padding, there should be an option available to suit your preferences. In addition to this, the Beroy Women’s Bike Shorts come with the added convenience of an elasticated non-slip thigh belt on the leg openings, preventing the shorts from riding up during your bike ride. Why We Liked It – The longer leg length of the Beroy Women’s Bike Shorts with 3D Gel Padding gives them a little more flexibility and a wider range of possible uses, while the non-slip thigh belt keeps them securely in place even during more strenuous cycling. The 4ucycling 3D Padded Bike Underwear Shorts are well-padded, comfortable unisex undershorts for cyclists of any level of experience and dedication. The padding on these bike shorts is made from foam, keeping weight and costs down, while still ensuring comfortable padding with an ergonomically designed cushion. These undershorts are designed to be longer-lasting than most competitors, with a sturdier construction for a longer lifespan. The material also offers a high degree of breathability and sweat-wicking to keep your legs cool and dry and is built for extra hip support to mitigate the potential hip strain from extended periods of intense cycling. Why We Liked It – Sturdier than many other options, the 4ucycling 3D Padded Bike Underwear Shorts are lightweight and affordable, while also offering strong hip support. The reduced padding of the pure foam pads is balanced out by a lightweight and an ergonomic design to the pads themselves, maintaining a high level of comfort. One of the higher-end foam padded models of bike shorts on the market, the Eco-daily Men’s 4D Padded Cycling Shorts are constructed with 6 layers of high impact foam in their seat pad, offering a high level of comfort and injury protection even during long-distance cycling sessions. The multiple layer construction gives more flexibility to the padded section of the shorts, allowing them to move with your legs as you cycle, and this flexibility is also visible in the 14 panel design of the legs of the shorts, offering more flexibility and muscle support than most designs. The fabric from which the majority of the shorts is constructed is highly breathable and wicks moisture effectively, keeping you cool and dry in high-exertion situations. Why We Liked It – The flexibility of the Eco-daily Men’s 4D Padded Cycling Shorts is unparalleled, with individually flexing and stretching panels designed to offer careful muscle support no matter how fast you’re moving or in what direction. The Santic Cycling Men’s Shorts Biking Pants with 4D Coolmax padding are among the more thoughtfully designed padded bike shorts on the market. The 4D Coolmax padding system is designed to protect against infection, eliminating the bacteria which can thrive in sweaty shorts and keeping your sensitive areas safe, dry, and healthy. The body of the shorts is constructed in a 12 panel design for added flexibility and muscle support, and the mesh panels built into the sides add an extra level of breathability. It’s worth noting that the sizing on these cycling shorts is numbered for the Asian market, and therefore Western buyers will want to choose a size or two larger than their normal leg size in order to get a pair that fits properly. Why We Liked It – The Santic Cycling Men’s Shorts are more breathable than many alternatives, offering a high level of antibacterial protection in an area of the body vulnerable to infection. This is an impressive level of thought and care devoted to an area that’s often forgotten about, making these shorts an excellent choice for anyone particularly sweaty or prone to infection. Designed for comfort and precise thermoregulation, the NOOYME Women’s Bike Shorts for Cycling offer a range of thoughtful features. 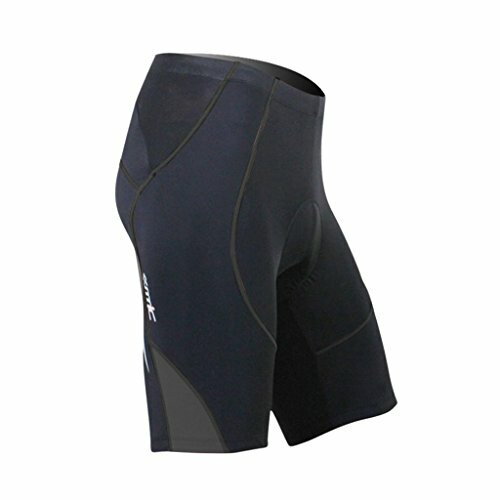 A longer model of bike shorts, they are designed to be worn as exterior shorts, unlike the shorter models which are designed to be worn under an outer pair of shorts. These bike shorts feature reflective markers on the outside for visibility and safety when cycling at night, although it’s still recommended to wear further visibility aids as these markers are quite small. For comfort, the 3D padding chamois is made from ergonomically designed multi-density foam designed specifically for the weight and body fat distribution of women, providing better support and comfort than shorts of male or unisex design. Why We Liked It – It’s rare to see a pair of bike shorts with foam ergonomically designed specifically for women, so the NOOYME Women’s Bike Shorts for Cycling fill an important niche in the market and do so effectively and with style. The Women’s Cycling Shorts with 3D Padding and Reflective Elements from SPOEAR are well designed and versatile. Built for exterior wear with no other pair of shorts over the top, these bike shorts are far more reflective than most, offering a higher level of visibility when cycling at night and keeping you safe in the dark. They offer gel padding for a high level of comfort during longer rides, while the lightweight and breathable body of the shorts also comes with silicone leg grippers to ensure that they don’t ride up and become any less comfortable during the ride. In addition to this, the range of sizes available goes up to XXXL, making these cycling shorts a great choice for users of any size. Why We Liked It – The versatility and wide range of sizes of the SPOEAR Women’s Cycling Shorts with 3D Padding makes them a strong choice for pretty much any user, fitting any intended use relatively well. 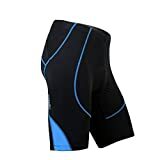 The Sportneer Men’s Cycling Shorts 4D are longer than many other models of padded bike shorts, designed to be worn as an exterior pair of shorts rather than as undershorts. This means that they come with cat eye reflectors built into the logo, offering higher visibility during bike rides at night. These bike shorts are built with 3 layers of foam padding, offering strong support and a high level of comfort while remaining lightweight and flexible. They also feature silicone leg grippers on the inside of the shorts’ leg apertures, holding them in place and preventing them from riding up even during longer periods of cycling at speed. 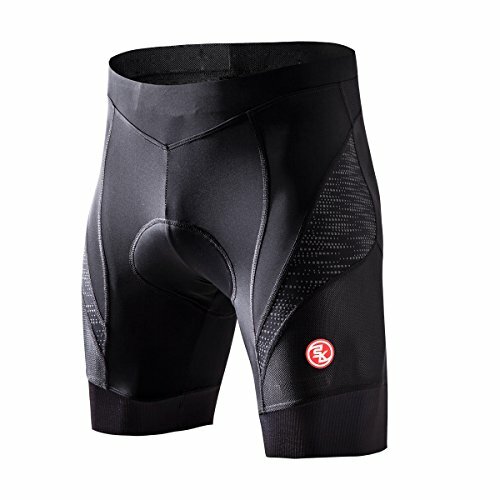 Why We Liked It – Combining the padding of padded undershorts with the sturdier exterior of regular sport shorts, the Sportneer Men’s Cycling Shorts 4D are a good option for anyone looking for simplicity in their cycling shorts, reducing the number of products you need to own in order to ride comfortably. You may have seen the term “chamois” used when discussing padded cycling shorts, but what does it mean? Well, it’s essentially just a term used to talk about the padding itself. The term itself originates from chamois goat leather, the original material used for early cycling gear, but that’s no longer the standard material. Since the 1980s most chamois pads have been made from synthetic materials, but the name is still the same, a holdover from the early days of cycling. The chamois is the most important part of cycling shorts, providing all the padding for your comfort and helping to prevent saddle sores. Most modern chamois are made from a padded inner, either foam, gel, or some combination of the two, and a lycra outer to keep it safe and sealed. The best of them are ergonomically designed, and some even feature anti-bacterial properties. Padded bike shorts can be made from a range of different materials, but most are made from some sort of blend of polyester and lycra, offering stretch, comfort, and breathability. Mesh panels add to the breathability, but reduce the stretch of the shorts; this is a balance that you need to consider and decide which option you prefer. Would you prefer to have stretchier shorts or a more breathable option? Models of bike shorts made from several panels tend to offer the best balance between the two, with mesh panels in locations requiring the most breathability and solid panels for stretch and structural integrity at the relevant points. Some of the padded bike shorts discussed above are relatively long, while others are very short. This is a question of intended purpose; the longer ones can be worn as undershorts or as a full pair of shorts on their own (which is why they often have reflective components), while the shorter models are designed specifically to be worn under another pair of shorts. This adds more effort to your preparation for cycling, as you have to choose and put on two pairs of shorts instead of one, but it also offers more flexibility, allowing you to choose longer or shorter outer shorts depending on weather or mood. Chamois pads may no longer be made of chamois leather, but the actual material used in modern padded bike shorts can vary substantially. Some shorts offer padding made from foam, while others have gel cushions. The gel options are often heavier and more expensive, but provide more shock absorbency and a greater level of comfort. Foam padding, meanwhile, is lightweight and affordable, but less absorbent. There are higher end foam options on the market, however, which mitigate that a little; multi-layered foam padding can provide a great deal of comfort, while those models offering multiple separate foam sections can offer a high level of flexibility and individual absorption. What about cycling in cold weather? Cycling shorts are small and lightweight, and those models made with a focus on breathability are particularly lightweight and offer minimal warmth. Fortunately, the flexibility offered by undershorts, designed to be worn beneath an outer pair of shorts, can help with that. A good pair of undershorts can be worn on its own in hot weather and under something a bit longer and thicker in cold weather, providing a layer of padding and sweat-wicking beneath the warmth and cover of anything up to and including leggings. Alternatively, shorts can be combined with legwarmers for added warmth without any risk of compromising the breathability of the bike shorts themselves. This option is perhaps less warm than the shorts and leggings combination, but it offers maximum breathability and wicking power in cold weather while still being warmer than cycling shorts alone. Why do you need all that padding? The padding on a pair of padded bike shorts can be fairly thick and bulky, making your body shape and movements look a bit ridiculous as soon as you get off the bike. So why do you need such heavy padding just to sit on a saddle that’s already well padded? Unfortunately, the answer is the dreaded saddle sore. The minimal level of movement your body experiences against the saddle when cycling, combined with the pressure against it and the hot, moist environment of a sweaty pair of shorts can be a dangerous and unpleasant combination. Improper padding can lead to further chafing, inflaming the sensitive skin of your saddle area and leaving it open to unpleasant infections ranging from simple skin irritations to bacteria-filled sores. Needless to say, this is unpleasant and best avoided. Properly padded cycling shorts can help to protect against saddle sores to a reasonable extent, although even the best of them won’t be 100% preventative; there’s always a risk of infection if you cycle too much. Better padding and a more ergonomic pad design will help to reduce the risk, while antibacterial and breathable materials can help defend against infection in the event that skin damage occurs, keeping your skin safer in most situations. The range of padded cycling shorts available on the market in 2019 can seem intimidating, and many of them are very similar in design, making choosing between them difficult. The good news is that any of the options above are solid choices no matter what your planned use for them is, as they offer a reasonably high level of versatility and durability. Whatever your personal needs, the guide above should help you to narrow down your choices a bit. The padded bike shorts discussed above are all among the best on the market at the moment, and any of them would be a strong choice for most users. The breakdown above should help you to decide on which pair of padded bike shorts is right for you and your personal needs, narrowing the field down a bit to make your choice easier. Any of these shorts would be a good pick, but hopefully this guide should help you to confidently make a decision with a greater understanding of the technical specifications of the shorts, and perhaps a better grasp of some of the technical jargon that can make the decision-making process so much harder than it needs to be.